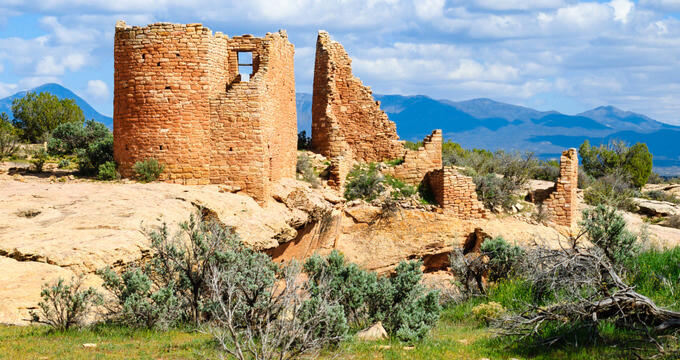 The Hovenweep National Monument actually encompasses six separate prehistoric Pueblo Era villages that have been found in a twenty-mile area around Cortez, Colorado. Guests visiting the area will enjoy the beauty of the scenery as well as the interesting history of the region. The history of human inhabitation at Hovenweep can be traced back more than 10,000 years to the nomadic Paleoindians. Settling of the area occurred around 900 AD and, by 1200 BC, the area was home to more than 2,500 people. However, by the very end of the 13th Century, many of the inhabitants left Hovenweep (due to drought, war, and depletion of resources). The area was declared part of the National Parks Service by President Harding in 1923. The best place to start when visiting the Hovenweep area is to stop at the Hovenweep Visitor Center, located at the Square Tower. Guests arriving to the Hovenweep area should simply follow the Visitor Center signs (while staying in their cars). Be aware that GPS is spotty and not always accurate, and that the roads will be both paved and dirt. Hiking around Hovenweep is one of the best ways to see the grounds, as it allows for nearly 360 degree viewing access of the pueblos. The hiking trails were designed with the structures in mind, although they also have amazing views of the geology, surrounding area, and local plant varieties. All hikers must stay on the designated trails (so there is no damage to the fragile cultural sites, archaeology, or desert ecosystem). Hiking trails are closed every evening at sunset and open again at sunrise. Do not touch any of the pueblo structures. Guests may also be interested in camping in the Hovenweep area. Monitor for any fire restrictions, which would mean no charcoal or wood grills are allowed in the area. There are 31 sites located near the Hovenweep Visitor Center, all located first come, first serve. The campground was initially designed for tent camping only, but a few of the camping sites are able to accommodate RVs as long as they are not larger than 36 feet in length. Groups can not include any more than eight people or have any more than two vehicles on site. All camping sites include fire rings (when applicable), picnic tables with a shade structure, and tent pads. There are no electrical hookups. Reservations are required in advance. The area is also well known for its amazing stargazing possibilities. One of the common historical stories about some of the pueblo structures is that they were created to mark the celebration of several, major celestial events. Hovenweep, due to the lack of any artificial lighting at night, provides some of the darkest skies that many stargazers will ever encounter. This allows for near perfect viewing of the stars at night. The website for Hovenweep also contains guides for visiting during each season - winter, spring, summer, and fall. Each season offers different, unique, and equally exciting opportunities to see the area in a different light. The Hovenweep area perfect for children to visit and learn about the history and culture of the region. The group trail that is located around the Square Tower is specifically catered to younger visitors. It is recommended that teachers and/or adult chaperones stop at Visitor Center to pick up their trail guide, which will help lead them through trail. The trail will take around an hour and a half to complete, on average. On certain days, the park rangers will provide interpretive talks at specific areas on the trail. Here, they can learn how to grind corn, use an atlatl, or even see and touch lizards. There is also a program called the Junior Rangers that was designed for children between 6 and 12 years old. Kids can pick up their free park ranger booklet at the Visitor Center and work through it at their own pace while visiting Hovenweep. It provides a variety of different games, activities, and scavenger hunts. There are no official places to eat while visiting the Hovenweep National Monument. However, guests who camp on site can bring their own food and, when the weather conditions are suitable, can also grill outside. The Visitor Center (located near Square Tower) has a small collection of souvenirs that can be purchased as well. All proceeds from these books and travel guides goes back into supporting the financial needs of the park.